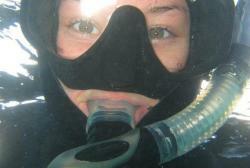 Have you ever wondered what it’s like to breath underwater? The biggest challenge instructors have is not coaxing participants into the water, but coaxing them out! Plus you can get credit towards your open water diver or scuba diver certification – putting you a step ahead of the game when you decide to go for it. There is nothing like breathing underwater for the very first time. It takes a little getting used to – after all, human beings weren’t designed to do that – but after a few minutes of awestruck wonder, most participants realise how easy diving really is. You will learn how to use scuba equipment in shallow water and get a quick and easy introduction to what it takes to explore the underwater world. Finding out what wearing scuba feels like; how easy it is to move around underwater; how easy it is to breathe and how comfortable you feel. You’ll also learn some basic skills and safety rules that will carry over to your full scuba certification course when you take the next step. All the equipment is included for your experience. A mask, snorkel, fins and buoyancy compensating jacket, together with a cylinder, regulator and instruments to monitor depth and air supply. 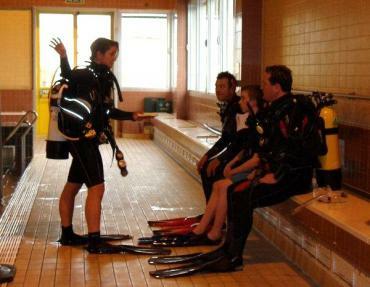 You may also wear a Wetsuit and wet system, depending on where your scuba diving experience takes place. What a great way to introduce children to scuba diving in a pool in less than 2 metres of water. Celebrate a birthday by throwing a memorable, exciting Bubblemaker party with friends and family with us. It’s fun, easy and safe. Youngsters can join in the family fun of scuba diving or even start a trend! Children should be comfortable in the water, but they don’t have to be super swimmers. The typical sessions last about 2 hours including signing up, gear up and fun included! 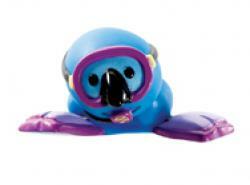 Take their first breath underwater and learn about and use scuba diving equipment made for children. Children use all the basic scuba gear, made for their size and stature. 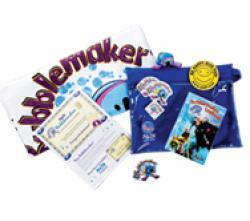 The Bubblemaker c rewpak gives kids a memento of their visit to the underwater world and is full of fun surprises. The pack includes: a kid-sized breach towel, log book, certificate, temporary tattoo emblem and the adorable and popular Bubblemaker “action figure”. Adults love them too. 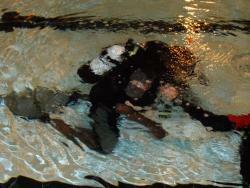 Aquamissions during the Seal Team program. 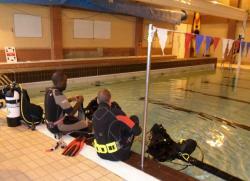 Those participants who are 10yrs+ can enrol in the Scuba Diver or Open Water Diver course. The PADI Seal Team is for young divers who are looking for action-packed fun in a pool by doing exciting scuba AquaMissions. Diving with torches and floating effortlessly like an astronaut. Here’s your chance to do some cool stuff in the pool, meet friends and share in the adventure of the underwater world. The best part of the Specialty Aqua Missions is they reinforce safe diving skills while the kids are having fun. PADI Seals get to sample a wide variety of dives. In addition it provides a structured program that lets children develop skills, learn about the aquatic environment and have a lot of good, clean, non contact fun. It is an excellent way to introduce kids to scuba diving prior to full Open Water Diver certification. Upon Successful completion of the first five AquaMissions, students become a Seal Team member. Upon successful completion of 10 additional specialty Aqua Missions, student become Master Seal Team Members. * Upon reaching the age of 10 years, children can complete the Junior PADI Scuba Diver or Open Water Diver certification. Explore the underwater world from the surface. The PADI Skin Diver certification help you get – and keep – your fins wet. While snorkelling is limited to peering down from the surface, skin divers generally venture further than snorkellers, making frequent surface dives to interact with aquatic life – up close and personal. The Course provides basic information on skin diving equipment, dive science, the environment, problem management and safe skin diving practices. Inwater training includes various techniques for donning and adjusting equipment, entering the water, checking buoyancy, surface swimming, clearing water from your snorkel and performing effortless surface dives. The best part is learning to use your mask, fins and snorkel so you don’t miss a moment of underwater action. You can use your new aquatic skills to explor a brand new world during an optional open water dive, and when you’ve completed the course you will receive a PADI Skin Diver certification card. At least 8 years + Comfortable in the water. This course requires less time than the PADI Open Water Diver course, covering only the first three of five sections of knowledge development, the first three of five pool sessions, and the first two of four open water training dives, resulting in a limited certification. If you expect to go scuba diving primarily in the company of a dive guide, or if you have limited time to devote to scuba certification, consider becoming a PADI Scuba Diver. This certification allows for ample dive experience and is a good warm-up for the Open Water Diver course, if that’s your ultimate goal. • Dive under the direct supervision of a PADI Divemaster, Assistant Instructor or Instructor to a maximum depth of 12 metres. • Obtain air fills, rent or purchase scuba equipment and participate in other diving activities, as long as they have the required supervision. The Scuba Diver certification opens the door to the underwater world for anyone who thinks that a course would take too long or be too difficult. • Upgrade to Open Water Diver whenever you want! With less time than the Scuba Diver course takes, you can make the jump to Open Water Diver certification and start scuba diving independently, whenever time allows or you’re up for more. • Buoyancy skills, including comfortable ascents and descents, and breathing underwater. • Staying warm underwater, streamlining your swimming skills and buddy diving techniques. • Diving environments and aquatic life you’re likely to encounter. • Preventing common problems underwater. • An introduction to boat diving. You’ll use all the basic scuba gear, some of which may be included with your course. You may want to invest in your own mask, snorkel and fins, however, as these personal items are a lot more fun to use when they fit properly. A buoyancy compensating jacket that holds your scuba tank, a scuba regulator that delivers air, a weight system and instrumentation to monitor depth and air supply will also be used. You will also be wearing a wet suit and weight system. PADI offers a variety of home-study materials for the Scuba Diver. While eLearning is the most convenient option, you may also choose a book and DVD package or a multimedia DVD-ROM. Your Next Adventure: You may want to step up to Open Water Diver certification at your first opportunity, but as a PADI Scuba Diver you also qualify to take: Equipment Specialist and Project AWARE Specialist certification courses. In the PADI Open Water Diver course, you learn to use basic scuba gear, together with a wet suit and weight system. • Be 10 years or older (PADI eLearning requires a minimum age of 13 years due to international internet laws. The Adventure Diver or Advanced Open Water Course, or various specialty courses.